Aaryn Goldberg, wearing her trademark green beanie, in front of the Porter Squiggle. Photo courtesy of Linda Kuck. “It was her ‘Happy Hat,’ for sure,” Aaryn Goldberg’s mother, Linda Kuck, remembers. 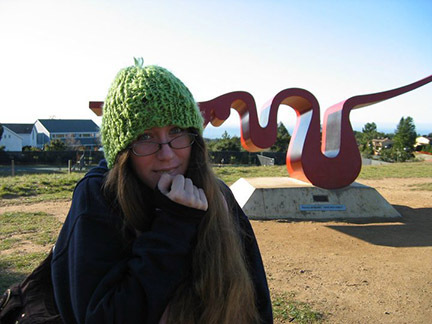 Kuck knitted her daughter a green beanie as part of one of her first “care packages” during Aaryn’s freshman year at UC Santa Cruz. She didn’t expect her daughter to wear it year-round — or everyday for that matter. Like her green beanie, Aaryn’s talent and kindness were her trademark. Aaryn, UCSC alumna (‘13), friend, daughter, sister and former Third World and Native American Students Press Collective (TWANAS) illustrator, passed away on June 2, 2015, four days after her 24th birthday. Kuck filed a missing person report after a few days passed without hearing from her daughter. She said it was unlike Aaryn to be uncommunicative, explaining they texted every night before falling asleep. “Goodnight Mama Lama, I love you,” was the last text Aaryn’s mother received before the prints from the missing person report matched a young woman’s body in the San Francisco Bay Area. The circumstances regarding her death remain undetermined. Aaryn was attending graduate school at the Academy of Art University in San Francisco, where she studied animation. A few days before her passing, she posted a link to her art blog which shared her past work and what she planned and looked forward to developing in the future. “Something that kept me afloat during the early few weeks after I found out was, that every single moment of her life, from the time she was a little kid, she was living her joy and sharing it with others,” Kuck said. Her mother recalled a time when Aaryn came home from elementary school and told her she was hungry because she hadn’t been eating her lunch. When Kuck asked why, Aaryn explained one of her friends had been coming to school without food, and that Aaryn would give her friend her entire lunch. “She asked if I would start packing two lunches — one for her and one for her friend,” Kuck said. Over the last two months, Aaryn’s Facebook page has been filled with posts capturing the grief surrounding her death and the gratitude for having known her. Fellow TWANAS alumna Kianna Anvari remembers meeting Aaryn her freshman year. Anvari described how TWANAS production nights would sometimes go until three or four in the morning and Aaryn, even if it wasn’t necessary, would stay the entire time just in case there was something editors needed help with. Aaryn’s father, Bennett Goldberg, said even as a child Aaryn had a special sense of selflessness. He explained that as small children, Aaryn and her younger brother would squabble, and in response he’d frequently say, “You’ve got to do the right thing.” When Aaryn was about seven and a half, Goldberg said she had come to a conclusion. Later, on the ride to Aaryn’s elementary school she stressed her point to her father by explaining when she didn’t want to share her toys, it probably meant it was right to do it anyway. Aaryn’s family and friends held two memorial services, one in Los Angeles where Aaryn grew up, and the other in San Francisco. Sasha Schlesinger, one of Aaryn’s best friends and UCSC alumna, organized the memorial in San Francisco where everyone in attendance was given a green beanie to wear in Aaryn’s honor. Aaryn’s benevolence is her legacy, and her compassion still lives within the hearts of her friends and family — one is unlikely to find another soul quite as talented, loving and thoughtful as the one resting under that green, knitted beanie. See more of Aaryn’s art on her blog.